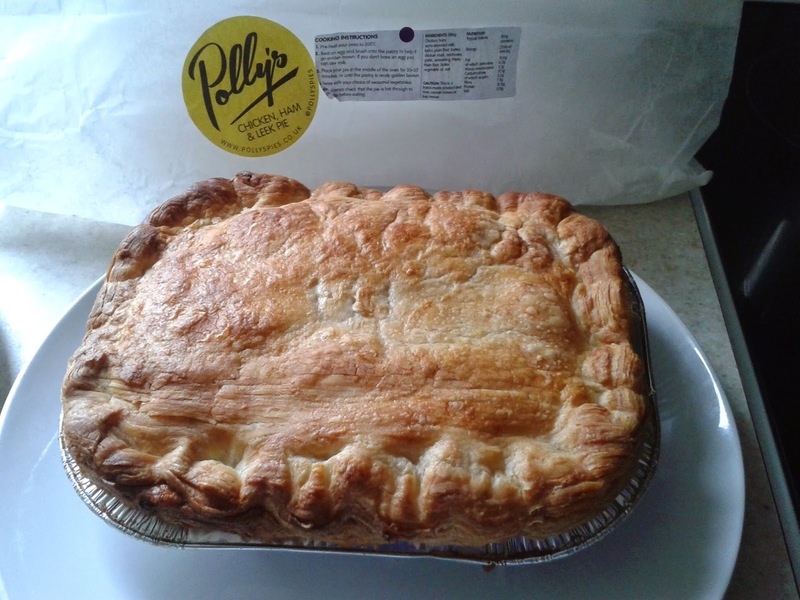 Pierate - Pie Reviews: Polly put the pies in and we’ll all have tea! This pie is whole roasted, slow matured Herb Fed (Yorkshire) chickens and gammon ham glazed in homemade Seville orange marmalade, in a very simple white sauce with leeks and Turner and George's "Tasty Bird Rub" as seasoning. Bursting with creamy and leeky flavour, this pie certainly caught our attention. Coming out of the oven after the recommended cooking time, the pie was a lovely golden colour on top with clear layers of puff pastry. It was crisp and flaky to the touch, cutting through nicely and making the content ooze out as the knife went through the pastry. In hindsight though, the pie could have been cooked for slightly longer as the pastry base and sides were a little under done (so a bit doughy and stodgy), however this would most likely have been at the detriment of the delicious top pastry. It’s a tough balance, but for me the pie was very much enhanced by the delicious crisp top pastry and while the base pastry was slightly underdone it had little impact on the flavour. This was primarily due to quite a big overhang of the top crust, which meant the crisp lid was a lot larger than the base of the pie. 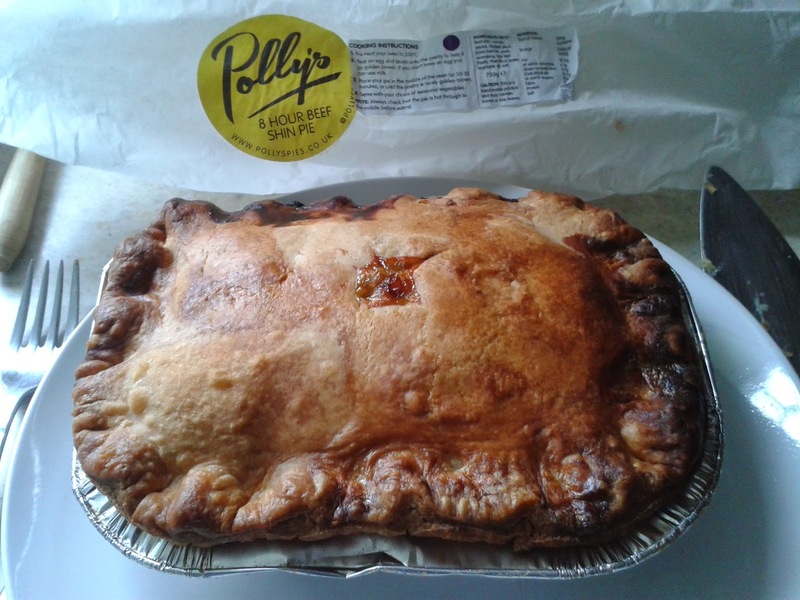 While this had potential to cause the pie to be too pastry heavy, this was not the case at all with Polly’s Pies, as the pie was crammed full of meaty content and the pastry:filling ratio was pretty much spot on. As mentioned, the creamy white sauce had plenty of flavour from the leek. Very viscous but not too much so. It was nice that they had used meat from the whole chicken, not just breast meat (although this may have contributed to RAS finding a little gristle in his half of the pie, which was surprising for such a high calibre pie). The addition of ham in large meaty pieces was welcome but didn’t add that much to the flavour, primarily due to the flavour of the creamy leek sauce. SJL found his half mainly consisted of chicken but wasn’t worried by this because it mainly seemed to be located in RAS’s half! However ideally the distribution of meat could be a bit more even. Overall this pie was very well filled and extremely satisfying. At £8.50 it was good value for a 750g pie which could serve a few people. The meat was in nice big chunks and seemed to be of good quality. One we would eat again. Again, the beef pie was really packed with content. The beef was falling apart after being slow cooked for – yes, you guessed it! – 8 hours. It wasn’t in chunks, so much as shredded. It was great to be able to get your teeth into so much meaty content. The gravy is simply from the carrots, onions and bone-in beef shins cooked for 8 hours in chicken stock. Unfortunately it did leak out a little from the pie and the base of the pie was a little soggy. Perhaps a slightly less runny consistency would improve the pie, but we were impressed to see chicken stock (from the chicken pie, no less) had been used rather than beef stock, which gave it a much lighter flavour than most beef pies. The buttery shortcrust the pie was cooked in was nice, quite crisp and tasted good, but was not as enjoyable in our opinion as the puff pastry used in the chicken pie. It didn’t cook as golden in colour and naturally wasn’t as flaky, struggling slightly to withhold the juices of the beef pie. 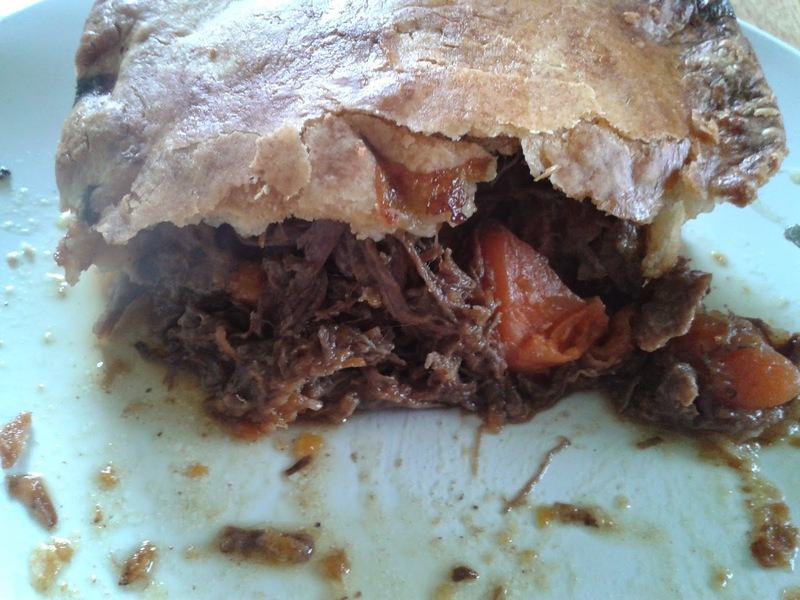 While we were impressed with the tenderness of the beef, the flavour of the pie due to the sweetness of the carrot and such a liquid gravy without so much flavour meant it didn’t stand out so much, but for the pure beef experience it was very satisfying. The carrot was perhaps a little too mushy and added an overly sweet taste to the content. Not quite as interesting to eat as the chicken as there wasn’t such a variety to the content and flavours, but the beef was very good. While we enjoyed eating both pies – and they were very filling! 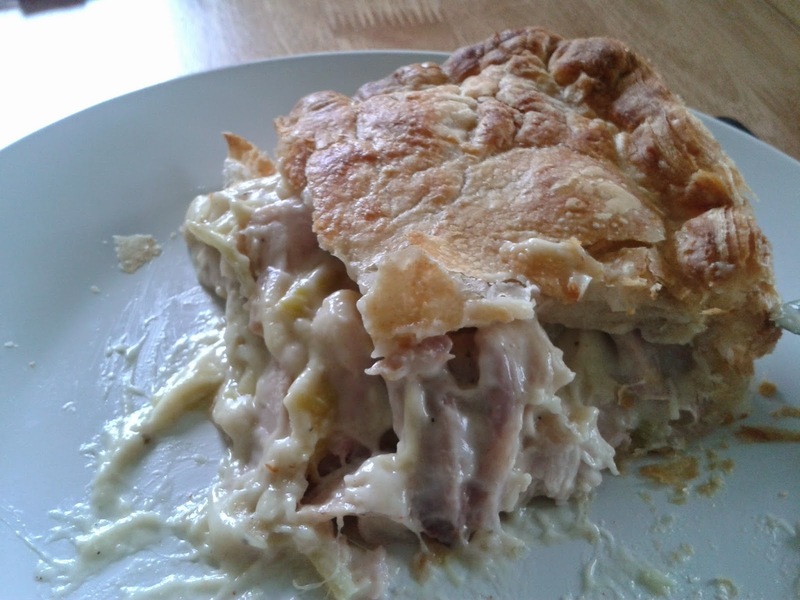 – the Chicken, Ham and Leek pie really stood out for us. A very high score and well worth our Pierate Recommended status! It’s quite amazing to think Polly has only been selling pies for a few months now, so thanks Polly for sharing them with us and we look forward to any other pies Polly may be having for tea!